To be revealed at next month’s Geneva Show, the new-look city car has a revised front end, new-look dashboard and extra equipment. These are the first pictures of the revised Skoda Citigo, which will be revealed in the flesh for the first time at next month’s Geneva Motor Show. The changes follow a new look for the Citigo’s sister car, the Volkswagen Up, and centre on a new look for the front and rear ends, with the bonnet, grille, bumpers and lights all revised. The headlights now include LED daytime running lights, and the foglights can be fitted with a cornering function as an option, lighting up the area the car is turning into. The end result is that the Citigo’s styling is now more in keeping with other Skoda models, like the recently revised Octavia. Meanwhile, at the rear, all except the most basic S-trimmed Citigos have tinted tail lights. If you choose a Colour Edition model, it will come with its roof and door mirrors finished in contrasting white or black. The changes also extend to the interior, with a new design for the instrument cluster, and a two-tone dashboard on higher-trim models. The stereos have been updated, too, with a colour display and Bluetooth connectivity on the Swing version. This then allows drivers to connect their smartphone to the system and operate some of the phone’s apps (navigation and so on). Last but not least, the Citigo also gains some of the ‘Simply Clever’ features the company prides itself on. In this car, that includes an umbrella under the passenger seat, a bag book on the glovebox, and nets in the boot. What hasn’t changed is what’s under the bonnet. The Citigo continues to be available with two versions of the 1.0-litre three-cylinder petrol engine, both of which average just under 70mpg on the combined cycle. 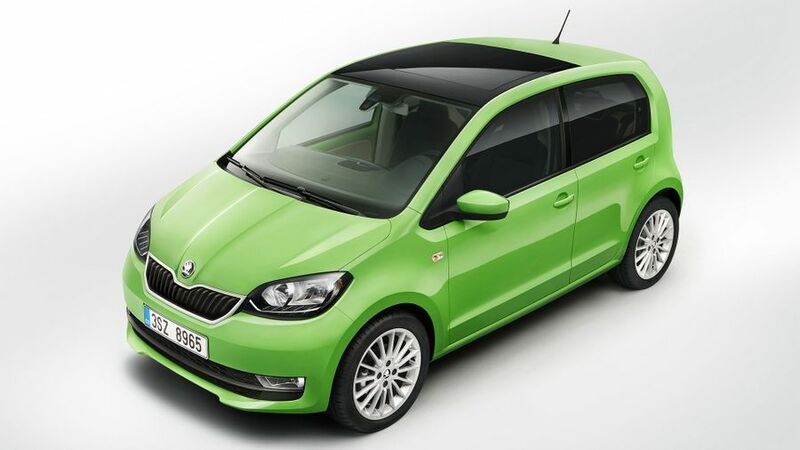 Skoda is yet to confirm exactly when the new Citigo will go on sale, but they have confirmed the car (a rival for the likes of the Hyundai i10, Toyota Aygo and Peugeot 107) will be available with S, SE, SE L and Colour Edition trims. Likewise, there is no word yet on prices, but we expect it won’t change too much from the current range, which costs from less than £8,500.